The Republic Lady Tigers didn’t let an early deficit keep them down. Republic’s relentless offensive pressure on Branson finally paid off with two second-half goals, as the Lady Tigers came from behind to beat the Pirates 2-1 in the district semifinals at Republic Tuesday. The win avenged an earlier loss to Branson during the regular season, also by a 2-1 score. Branson struck early on a corner kick, bouncing the ball into the net off the post and grabbing a 1-0 lead that left the Lady Tigers momentarily reeling. Republic had its best chance to tie before halftime in the 10th minute. Clara Fronabarger got open in the box and thumped a shot off the post, but it ricocheted back into the field and Branson’s defense was able to clear it. After halftime, the Lady Tigers controlled the pace of the action, mounting a series of attacks, only to be turned away by goalkeeper Lauren Garrison. But in the 53rd minute, Sarah Hicks pounced on a loose ball in the middle and drilled it past Garrison from the top of the box to tie the score. 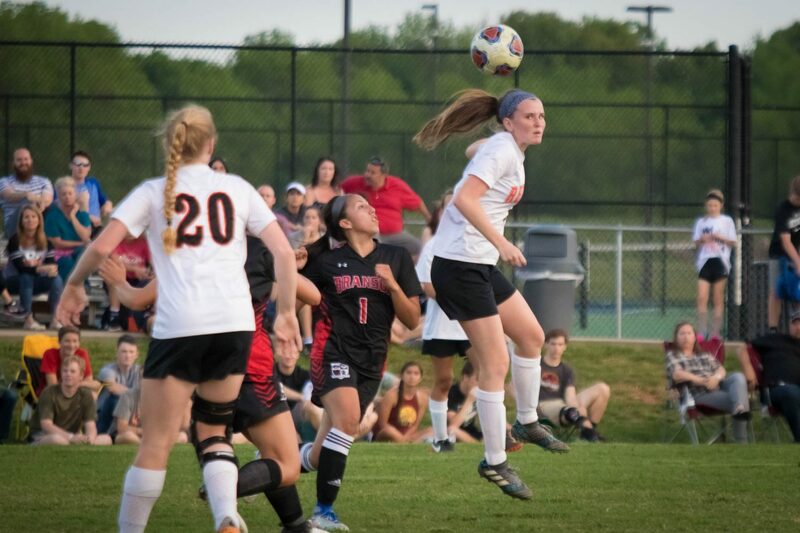 The Lady Tigers rode that momentum the rest of the way, peppering Garrison with shot after shot until finally breaking through again in the 69th minute. After Branson committed a foul in the box, Jones stepped up to knock home the game-winner. Republic improved to 14-6. The Lady Tigers advance to the district championship game at home against Nixa Thursday night at 6 pm. Find out how you can get $25 worth of free photos as a subscriber to Republic Tiger Sports magazine. Sign up now, before this offer runs out! Coach Kevin Hauck encouraged freshman Sarah Hicks to play with confidence, and especially after halftime, that’s exactly what she did. When Hicks saw a loose ball in the middle of the Branson defense, she jumped on the opportunity and drilled it 25 yards into the back of the net to tie the score. Her goal gave Republic the momentum, and she’s our Farr Better Play of the Game.